A tactical successor to Ogre Battle: March of the Black Queen. Battles no longer had any real time elements and were instead more standard turn based affairs. 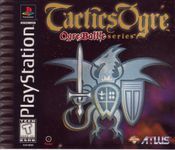 It later inspired Final Fantasy Tactics for the Playstation. The subtitle of Let Us Cling Together is a reference to the Queen song "Teo Torriatte" (Let Us Cling Together) from their album A Day at the Races. This is one of many references to Queen songs in the series, including Ogre Battle: March of the Black Queen, which references "Ogre Battle" and "The March of the Black Queen".